Situated just shy of Rodin and Michelangelo, the David Hockney exhibition radiates new life, color, and some California sunshine (much needed on the east coast) into the Metropolitan Museum of Art. This exhibit marks the artist’s 80th birthday, celebrating his six-decade career with some of his most iconic work. The show unfolds over eight rooms, featuring all of the artist’s many mediums including: paintings, drawings, and photography, as well as his notable iPad paintings. 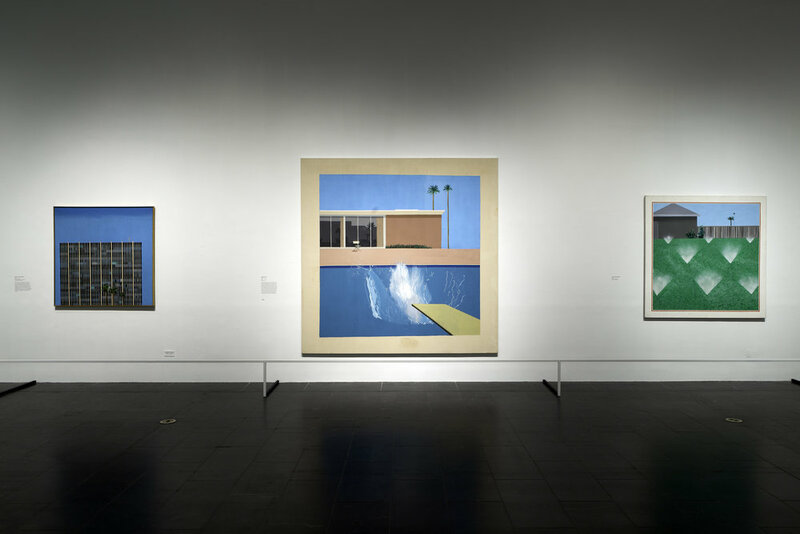 For the high brow art-goers and the notorious eye rollers, as The New Yorker recently deemed them, it would be wise to check any inflated views at the door that limit Hockney to his métier of glistening L.A. pools, palm trees, and jewel-toned landscapes. As an English national treasure, Hockney’s work holds a gravitas of its own beyond his notoriety gained during the swinging sixties. Following its tour at the Pompidou in Paris, and the Tate Britain in London where the line to the exhibit was out the door, David Hockeny’s exhibit is sure to amass a new following as ardent as his existing coalition of followers. Hockney is a rare breed of artist whose sheer love of the craft engulfs the art from the moment the brush touches the canvas to the moment it leaves. He is deeply experimental and enjoys the science of art. It is almost as if his paintings are an answer: how to make the invisible visible or how to dilute acrylic to appear as translucent as real water. It is something of an awe, walking from room to room where one can witness the passage of time decade by decade and see the artist cleave under every artistic movement while retaining his unique perspective, as well as his eye for color and movement. 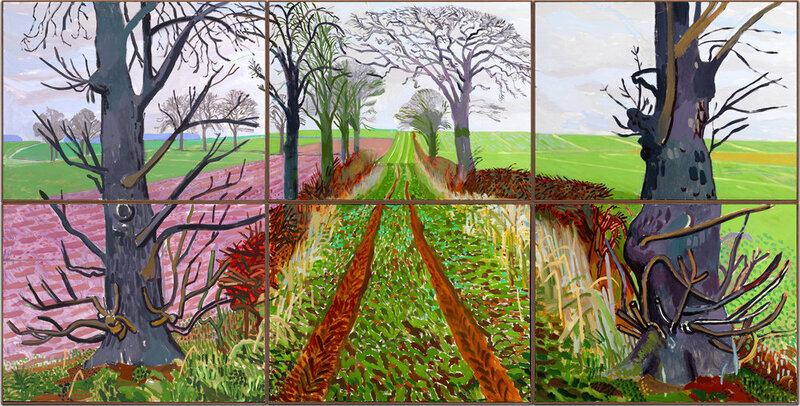 Born in West Yorkshire, Hockney moved to London in 1959 where he studied at the Royal College of Art. His persona with his round glasses, flashy cardigans and mop blond hair became quickly known, as well as his brazen societal and artistic conventions. Openly gay in a time that was not as evolved, his work bravely explored his sexuality with a dedication to figuration, defying conventions on both sides of the Atlantic. Hockeny’s work is deeply personal. There is an interest in his friends, family, and lovers as subjects. The late sixties and seventies reflect his keen interest to social tension, evinced by his double portraits. In Christopher Isherwood and Don Bachardy(1968), the viewer almost feels a part of the room, as well as this comical love triangle. The phallic fruit bowl in the middle acts as a comic break to some of the spatial tension. The 1970’s through the 1980’s showcase Hockney’s use of Matisse-like hues, and his attention to cubism and the works of Pablo Picasso, with a nod to Hockney’s photo collages. While there is hardly any photography in the exhibit, the photo collage of Hockney’s mother with her English backdrop is wonderfully endearing. 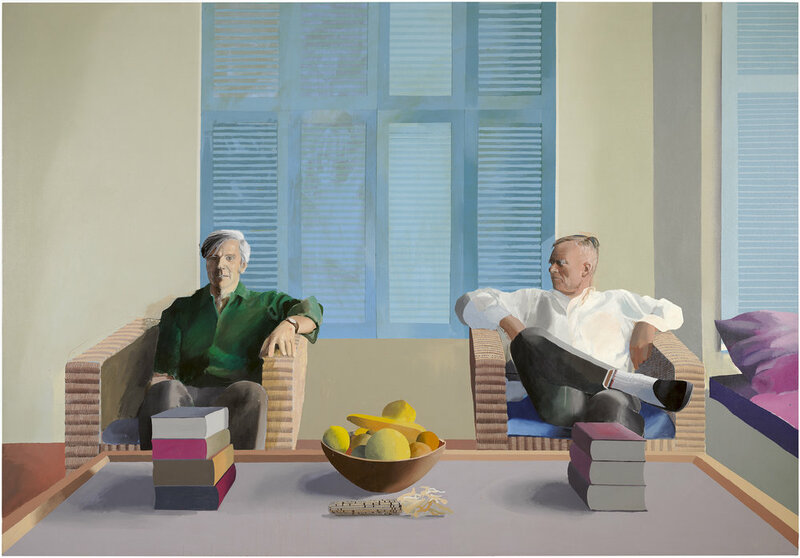 Hockney has expressed a qualm with photography in that it trains one to see everything, where as Hockney is interested in examining the choice behind showing preference for certain details over others. In recent years, Hockney has reverted back to his town of Yorkshire in painting landscapes where he had said, “Some days were just glorious, the color was fantastic. I can see color. Other people don’t see it like me obviously.” The exhibit ends with his iPad drawings of his views from California, which limn a kind delightful trip into the world of synesthesia. The painting A Bigger Splash (1967) almost feels like a cameo, as it magnetizes observers much in the way a Van Gogh sunflower brightens the room with its colors and emotes the atmosphere with its sunny disposition. Aesthetically pleasing like most of Hockney’s work, the painting is brilliant in its ability to shatter what feels like an otherwise still moment with the insertion of the diving board with its rippling water effect, which is not shallow but deep. For those who are of “art of the mind” versus the “art of the retinal;” what is to beget from the joy of a palm tree or the jump off a diving board? Better question would be to ask oneself: why give gifts or why smell flowers? Why not just live. David Hockney is on view at The Metropolitan Museum of Art from November 27, 2017–February 25, 2018.